Guelph, Canada. May 11, 2018. In the basement of the Centre for Biodiversity Genomics (CBG) building, behind two sets of locked doors, organized in a bank of ultracold freezers, is a gold mine – at least in the eyes of a biodiversity scientist. It’s the CBG’s DNA Archive. Apart from an occasional tour, the only person who generally enters the room is Dr. Suresh Naik, CBG’s Research Scientist and Curator of the DNA Archive. 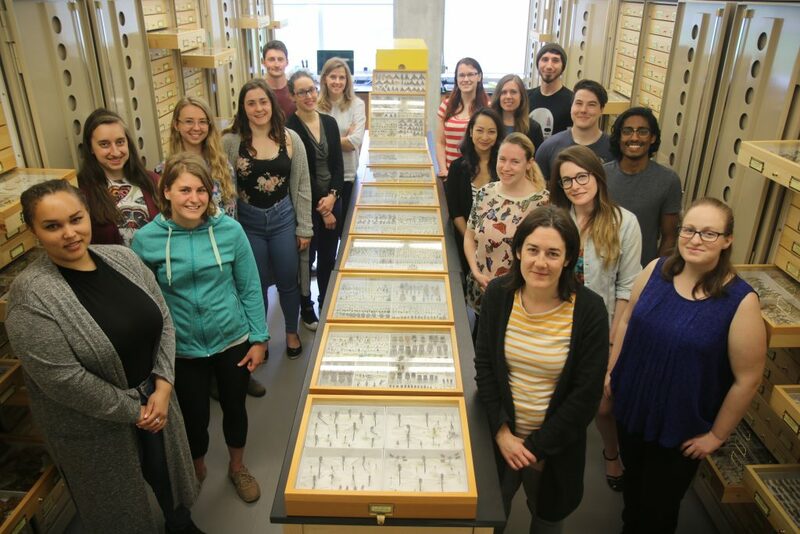 As of this week however, a significant proportion of the archive’s holdings will be made visible to other researchers in Canada and around the world. With an award from the Global Genome Initiative at the Smithsonian Institution in Washington, DC, the CBG is publishing sample information for 1.5 million DNA extracts held in its archive. Each DNA sample was recovered from an animal specimen collected in Canada that is now held in CBG’s natural history collection. This amounts to nearly 65,000 species, collected from coast to coast to coast, mostly in Canada’s national parks and other protected areas. Three quarters of the samples will represent the first genetic resource record for the species in public databases. In addition, each sample is linked to its DNA barcode, a short sequence of DNA that is used to identify and differentiate animal species. University of Guelph Professor and CBG’s Scientific Director, Dr. Paul Hebert, pioneered the method of DNA barcoding that is now widely adopted in many scientific and applied disciplines, particularly biodiversity science. The DNA barcoding conducted at CBG over the last decade, funded by the Canada Foundation for Innovation, Genome Canada and Ontario Genomics, the Ontario Ministry of Research, Innovation and Science, and more recently, the Canada First Research Excellence Fund, has resulted in an archive of over 5.3 million DNA samples. “When you consider the size and diversity of our DNA sample collection, it’s really quite remarkable”, says Naik. “In fact, it stacks up to – and in many cases, exceeds – the DNA banks of the world’s largest natural history collections and genomics facilities. And check in with us in another decade. That’s another extraordinary aspect of our archive – it has been assembled over a relatively short period, and it’s continually growing”. CBG’s Collection Data Management Lead, Angela Telfer, constructed a new database to manage the DNA sample data for the archive, including the exact plate and freezer location of every sample. The information for 1.5 million Canadian records – about one quarter of the entire archive – were then compiled and prepared by Naik and Telfer for publication, following international data standards. Dr. Kyrylo Bessonov, former CBG postdoctoral fellow, and Leon Loo, Manager of Systems Management at Computing and Communications Services, teamed up to prepare a webserver to publish the large dataset online. This week, with help from the network’s Technical Manager Gabi Droege, the sample data go public on the platform of the Global Genome Biodiversity Network, a consortium of institutions making their DNA and tissue collections discoverable for research. “Our DNA archive is becoming well-known and well-used by researchers around the world”, says Telfer. “Carefully following the transfer agreements and permit restrictions of those samples, there have been over 200,000 aliquots of DNA prepared for other institutions in the last decade. Making our collection more accessible will likely lead to even more requests”. Researchers have used the DNA for a variety of projects, most often to study the evolutionary relationships or full genomes of their organisms of interest. “We will do our best to accommodate those requests, with permission from the original donors”, adds Naik, “and we will be delighted if more DNA samples find their way out from the basement and into the hands and projects of more researchers”. CBG’s specimen and DNA data can be found on its webserver and on the GGBN portal. For inquiries or requests, please contact info@ccdb.ca. For additional media coverage, please see articles by the University of Guelph and the Guelph Mercury Tribune. A tiny fraction of the over 5.3 million DNA extracts held in the CBG’s DNA Archive. 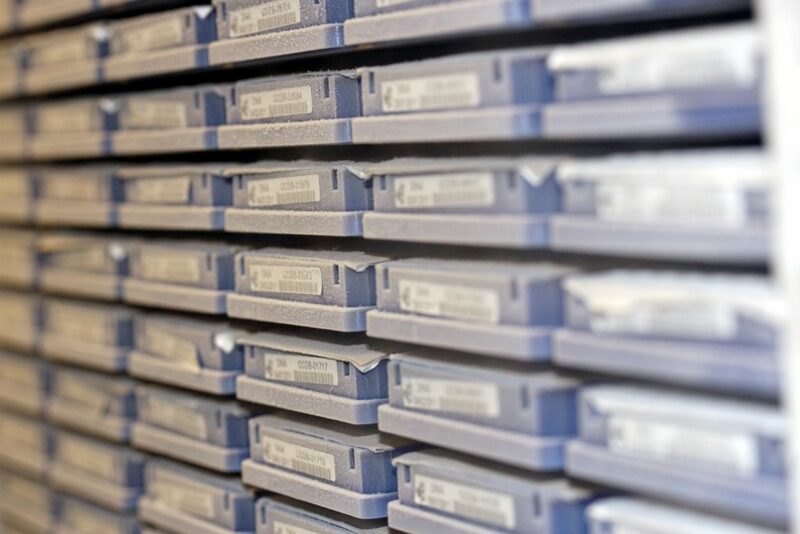 Each microplate holds 95 individual genetic samples. 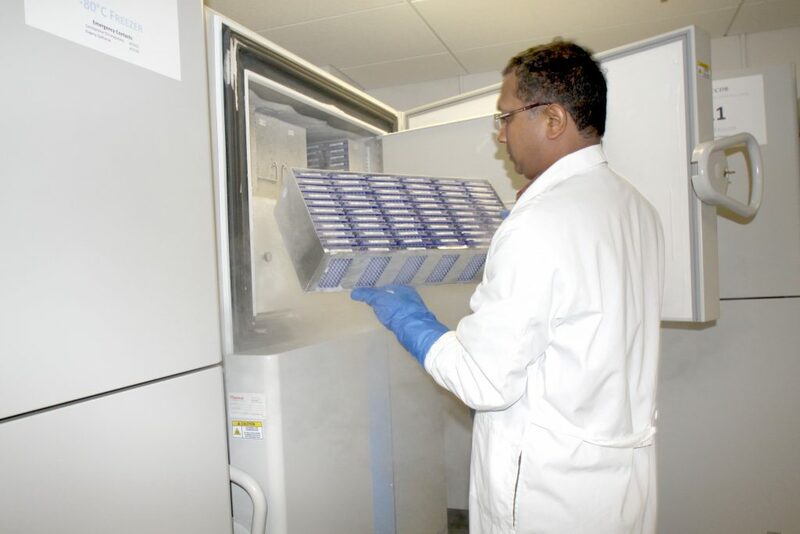 Dr. Suresh Naik, Research Scientist and Curator of the CBG’s DNA Archive, pulls out a rack of 66 microplates from an ultracold freezer. The CBG Collections team in the Specimen Archive. All 1.5M DNA samples having their data released are DNA barcoded and derive from a voucher specimen held in the CBG’s Specimen Archive.